I, like many of you, am guilty of the "P-word"! PROCRASTINATING!!! Usually when I want to get things done I set a timer for at least 15 minutes and work on that task. But this time I decided to see how long a few things would actually take so that I could share them with YOU, in hopes of encouraging US. Clearing off my nightstand/bookcase 4:46...GREATNESS huh? Finally, I had a couple of boxes I've been staring at since I moved in. Within 30 minutes VOILA! Soooo in about 38 minutes I had unpacked 2 boxes, cleaned out receipts from my purse and organized my nightstand. Not bad at all. What have you been putting off? Set aside 5 minutes now and another 5 minutes tonight and you might be amazed at what you can accomplish in so little time. TAKE 5...Action! As you guys know, I enjoy going to the open houses because I get a chance to see all types of decor. I love seeing how others live. Also when I think the home is fabulous I am always wondering WHERE the current homeowner is moving. Call me curious or call me nosey.... I like what I like! Below are pictures of a tri-level townhome... the owner (local news anchor) will be relocating to LA. This artwork was on the wall in the guest bedroom. I love it! The living area.... I am a person who likes ALOT of stuff with a "homey" feel but I can appreciate the minimalist approach. Guest Bedroom.... I could certainly curl up here for a weekend visit. Master bath... look closely on the left in the back.... that's the washer & dryer. Make sense because you take your clothes off here as well as towels but I'm not so sure how I feel about having it in the bathroom. Well that's it....Lemme know if you wanna share pics of how you live, I'm always eager to look! Smooches! If you love a clean home this is for you! I am IN LOVE with this product. I learned about it from Kevin Sharkey's blog. I ordered it and I can't get enough of it. In fact, I am about to order another pack for the bathroom. It's also a GREEN product. 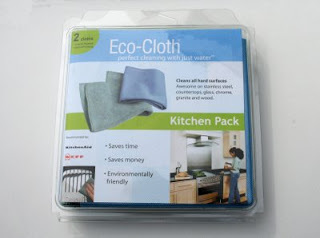 This kitchen pack comes with 2 cloths ($18 w/FREE & fast shipping) general purpose cloth and a glass polishing cloth. All you need is water to use these. I spray water on my glass, mirrors, countertops, fridge or whatever and wipe with the glass polishing cloth and there are NO STREAKS. This cloth is THE BUSINESS! I also wet the general purpose cloth and wipe down stuff and follow with the glass polishing cloth. I even use the glass polishing cloth to dry wine glasses or anything that I don't want fingerprints on. I'm telling you this product is FABULOUS! I have totally cut down on my paper towel use and the use of cleaning products. If you decide to order let me know what you think.... Smooches! It's been a while since I've updated my blog. One word: LIFE! Many of you know I've moved, gone thru a break-up and turned 40 all during the same time frame. I've taken quite a few pictures and thought I'd share a few with you in an effort to "get back on the horse" with my blogging. I'm reminded of the quote fall down 7 times and get up EIGHT! Feel free to check back often for updates.... Smooches! Sooo excited to have a gas stove! First meal I made (chicken fajitas) I make this often... made it twice here already. The BEFORE: Ugh! I have a SMALL love affair with books! I got a lot to do. AFTER: I got most of the cookbooks organized. My new view! It's great and I feel soooo BLESSED! It makes me HAPPY to look out the window! Join me for this FOCUS DAY on April 14th!